Like most members of the male species, and particularly the geekier types, I love gadgets. Complex ones are great, but sometimes the greatest satisfaction can come from simple things that just work really well. Here’s a couple of recent buys for me that fall into this category that I thought I’d share. When we’re on holiday I often spend time trying to find places to put the camera so we can do a timer shot with us both in the picture, and when you’re in forests and up mountains finding a level spot is tough. I’ve gotten quite good at it, squinting at rocky outcrops and tree stumps with an almost film director level of interest, but it’s still awkward and sometimes precarious; this year in the Canadian Rockies I placed the camera on a rocky slope and only realised when I had to charge down again how many rocks were between me and the ‘mark’ I had to be at within 10 seconds, and I almost came a cropper, much to the displeasure of my wife. I’d seen the Gorillapod before but kept forgetting to buy one before we went on holiday, so this time I bought one as soon as I thought about it, even if it’ll be sitting around unused for a while. Basically it’s just a small tripod made from a series of ball joints, each one perfectly stiff under the weight of a camera but easy enough to move, and with rubber surrounds on every joint and on the ends for grip. 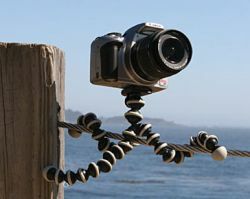 It’s very bendy and yet very sturdy once it’s set, so you can use it as a regular mini-tripod (but can adjust for uneven surfaces really easily), or you can suspend it from tree branches and poles, secure it up on top of fences or bollards just by bracing it, and all kinds of things. 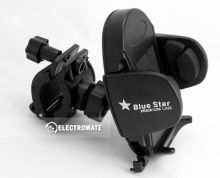 It just clips on to a small tripod mount and folds up really small. It’s just an incredibly useful little gadget that I wish I’d had for holidays ages ago, and I imagine regular photographers would find it invaluable too. I don’t ride a bike anymore, but after setting up my drum kit I realised I needed somewhere to mount my iPod if I was going to hook it up for practice, rather than having it on the floor or using gaffer tape or something. Surprisingly there didn’t appear to be any standard accessories to do this (a bit of an oversight on Roland’s part I think since this must be a common requirement), so I was nosing around in the VDrums forum and discovered that most people were just using regular old bicycle mountings, and attaching them to one of the cymbal riser arms (since they’re about the same diameter as bicycle handlebars, compared to the main drum frame which is much thicker).